Those of you who are regular followers of MusiCB3 will be aware of our two previous posts on Thurston Dart. This one follows on from those, looking especially at the recordings held in the Dart Archive here at the University Library. First a mini-biography: Robert Thurston “Bob” Dart (1921 – 1971), musicologist, performer and teacher was educated at Hampton Grammar School, (where he was a chorister of the Chapel Royal, Hampton Court), at the RCM (1938–9) and read mathematics at University College, Exeter (BSc 1942). After service in the RAF during World War II, he studied in Belgium with the distinguished musicologist, critic and founder of Pro Musica Antiqua Charles van den Borren [subscription required]. He returned to England in 1946 and the following year was appointed an assistant lecturer in music at Cambridge University, a full lecturer in 1952, a fellow of Jesus College in 1953 and Professor of music in 1962. A difficult two years ensued until in 1964 he took up the newly-created King Edward Professorship of Music at King’s College London. He was a highly respected editor, and as Secretary of Musica Britannica, remained the driving force behind the series to the end of his life. He also served as a council member of the Royal Musical Association from 1952 and was on the editorial committee of the Purcell Society. Dart practiced what he preached and led a full life as a musician, performing on the harpsichord, clavichord and organ and from 1955 he was music director of the Philomusica of London (previously the Boyd Neel orchestra). He was also a keen viol player. A few more of the LPs in the Thurston Dart archive. © Cambridge University Library. The Dart archive at the University Library includes nearly all his recordings (about 80 – all of them on LP and, apart from a handful transferred to CD, all sadly no longer available), many of which were made for L’Oiseau-Lyre with whom Dart had a long association, starting in 1950. Other labels for whom he recorded included Decca and HMV. As a musician at the centre of the early music revival of the 1950s and 60s, the repertoire is as one would expect: firmly in the Renaissance and Baroque including Bach, Couperin, Dowland, Handel, Purcell, Rameau and Alessandro Scarlatti together with a range of compliation albums such as Dances of Shakespeare’s time [OL50127 c.1956] and Songs for courtiers and cavaliers [OL50128 c.1956] both for L’Oiseau-Lyre. For many of these recordings, Dart has also provided the sleeve notes. 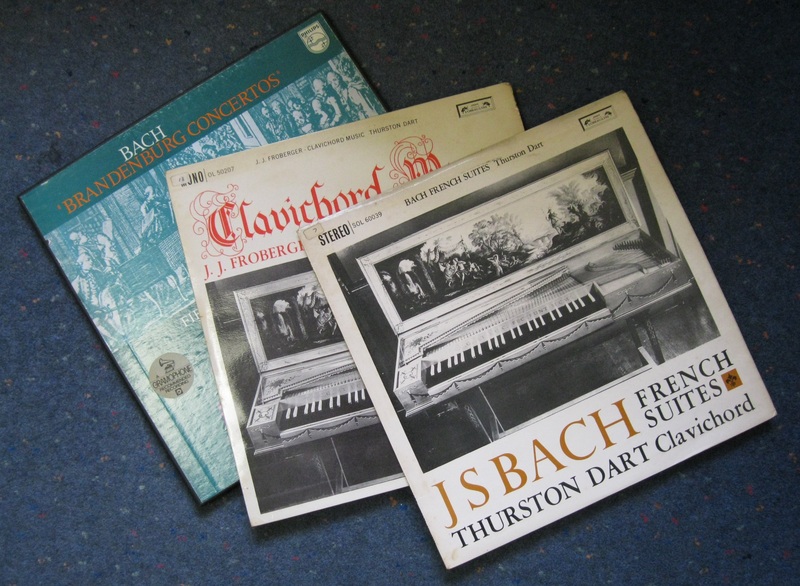 Impossible to cover anything in any detail in this short post of course, but here are a handful which stood out for me: he made several recordings using that most wonderfully intimate and sensitive of all keyboard instruments, the clavichord. 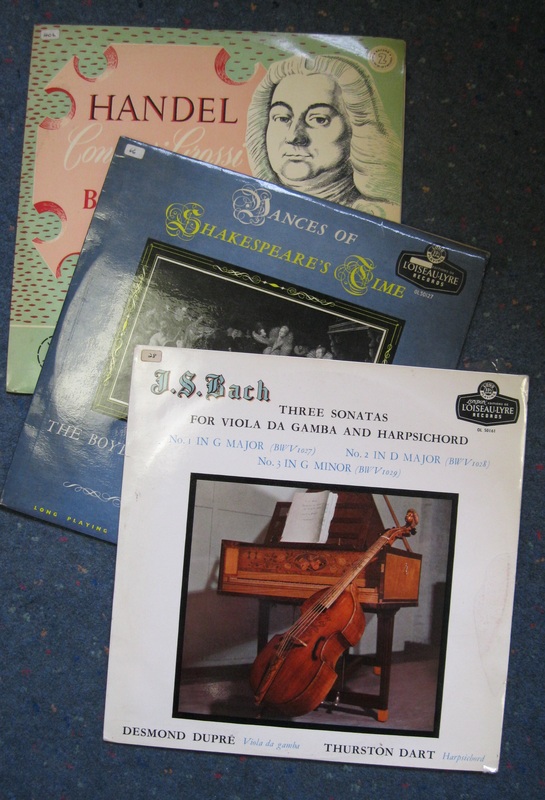 A good example from the archive collection is of a selection of pieces by Froberger [L’Oiseau-Lyre OL50207] made in 1961 (happily reissued on CD and available at the Pendelbury Library [CD.Q.178], along with Dart’s recording of Bach’s French suites [L’Oiseau-Lyre SOL60039. CD.Q.177]). For sheer eccentricity and joie-de-vivre, how about the album of works for 3 and 4 harpsichords? 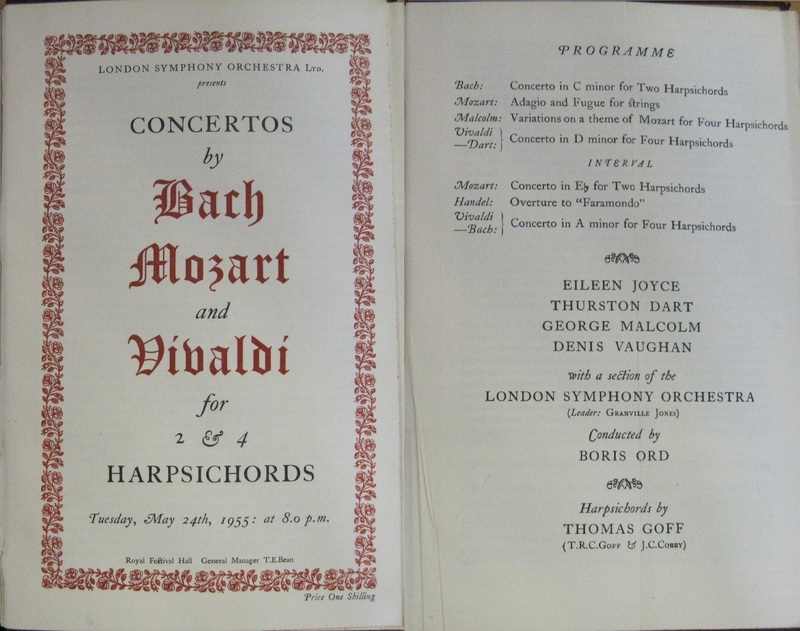 This is based on the annual jamborees at the Royal Festival Hall in the 1950s for massed harpsichords including Dart, George Malcolm, Eileen Joyce and Dennis Vaughan playing on instruments by Thomas Goff, often with members of the London Symphony Orchestra and usually conducted by Boris Ord. The recording for HMV [CLP1120, 1953] features the same soloists and conductor but with the Pro Arte Orchestra in works by Bach and Vivaldi. His last recording (included in the archive), made whist he was desperately ill, was of the Bach Brandenburgs with Neville Marriner for Philips [6500 186-7, 1971]. Against all the odds, he was able to complete his role as continuo for nos 2 and 4, and they stand as a fitting tribute to his musicianship. Enquiries about materials in the Dart archive, including the recordings which may be consulted by arrangement at the Pendlebury Library, can be made by emailing music@lib.cam.ac.uk. This entry was posted in Uncategorized and tagged Cambridge University Library, Musicians' archives, Sound recordings, Thurston Dart. Bookmark the permalink.